Last weekend we decided to have a look at a house being sold a few doors up from us. During the “Open For Inspection” the realestate agent, Craig Currie, invited prospective purchasers to visit his website for a floor plan and more information. We are 12 or 18 months away from being in a position to purchase a house, but decided to look at the website anyway to see the floor plan. I went to craigcurrie.com.au and clicked on “Properties” and was shocked to see one of my own photos had been stolen and used without permission. I immediately recognised the photo as one I had taken in 2011 with my first DSLR camera. 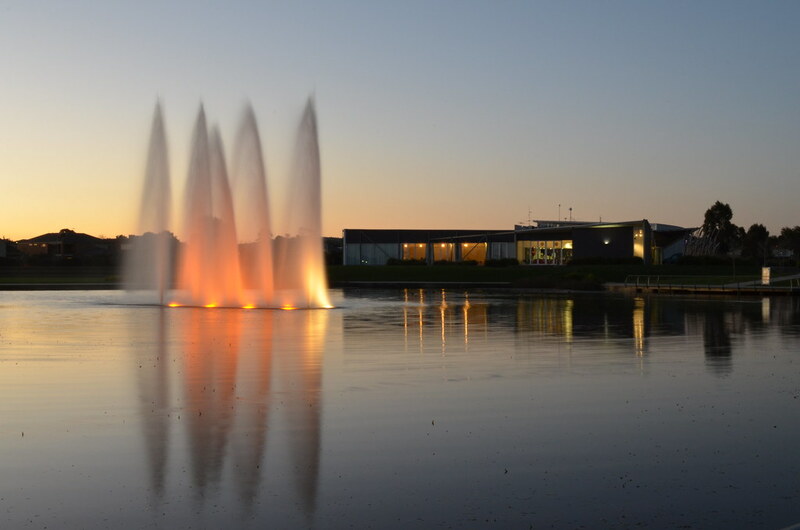 I was experimenting with long exposure shots of the Lakeside fountains, Pakenham, at dusk. I wrote a blog post at the time about shooting long exposures, but back in 2011 I was publishing photos to my Flickr account. Checking the photo I’d uploaded to Flickr in 2011 against the picture I was able to copy from the realestate webpage confirmed they were exactly the same. The “Properties” link on Craig Currie’s website actually linked to his realestate.com.au page, which is where my photo was appearing, so I wasn’t exactly sure who had infringed my copyright. 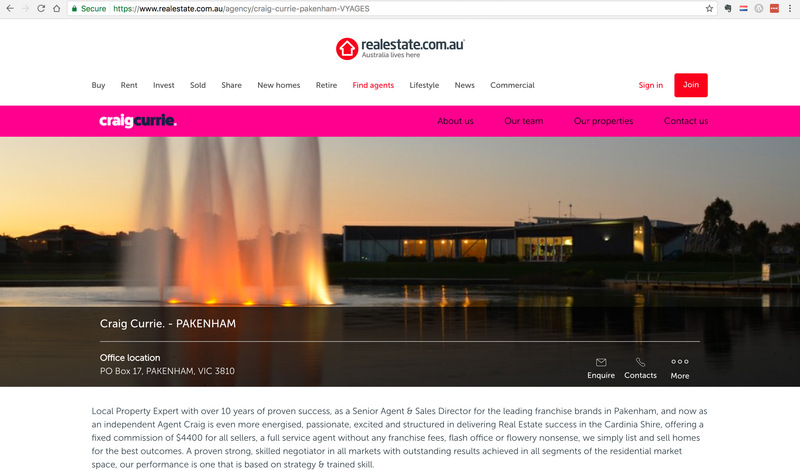 A search of other realestate.com.au profiles of Pakenham agents didn’t show any similar photos, so I was suspecting Mr. Currie. When Craig Currie contacted me by text message to enquire if we would like to make an offer on the property, I responded by informing him that he had used a photo that was copyright to me. I asked him to either remove the picture or compensate me for its continued use. His response was to claim the photo was supplied by someone called “Photojenik” and to ask how much it would cost to continue to use the photo. I told him $200 would be a reasonable amount, but he instead promised to have the photo removed. Craig Currie reiterated several times that he had never heard of Flickr and that the photo was supplied by Photojenik, who he said was a local photographer who specialised in realestate photos. Mr. Currie said he would pass on my phone number for her to contact me. To Craig Currie’s credit, my copyright photo was removed, but I haven’t heard from Photojenik. I know photos are stolen and copyright infringed all the time, but that doesn’t make it right. If Photojenik is a real person or photography business, then stealing another photographers image is pretty low! But is Photojenik real? I cant imagine a photographer without any online presence, however Google and WhitePages searches for that name come up with nothing. Is it cheating to only edit fireworks photos with Instagram? On Australia Day evening I sat on the beach at Mornington with the family to watch the fireworks. I haven’t done much fireworks photography before, but I took my camera and tri-pod anyway. I wasn’t sure what the ideal settings would be, but I thought I’d have a go. I thought the pyrotechnics would be launched from the pier, but they were actually set-up further out on a barge, so my camera was pointing in the wrong direction and missed the start of the display. Not refocusing after rushing to re-aim the camera towards the fireworks resulted in some blurry light streaks. After quickly pointing the camera in the right direction, the horizon was no longer level. In the end, I managed to get a couple of ok shots using a two second exposure. Nothing great, just ok. Afterwards I uploaded the shots to my phone and did some quick adjustments in the Instagram app and published three of them. Those fireworks photos don’t look too bad on the small iPhone screen, but I know they are actually crap because they’re heavily cropped and either under or over exposed. Since then I haven’t even bothered to upload the photos to my computer, let alone process them in Lightroom. So is this photography cheating, because the only post processing and publishing is done on the Instagram app? Yesterday I said I was going to try and do more long exposure star trail photography. Well, the opportunity arose shortly afterwards. My son needed to be picked up from Hastings at 6AM. It was a clear night, so I decided to head out a few hours earlier for some night photography. I went to Arthurs Seat on the Mornington Peninsula, which was only around 25 minutes from where I had to be at 6AM. I’ve already written about it over on Vic Pics, but suffice to say I’m really happy with how it turned out. 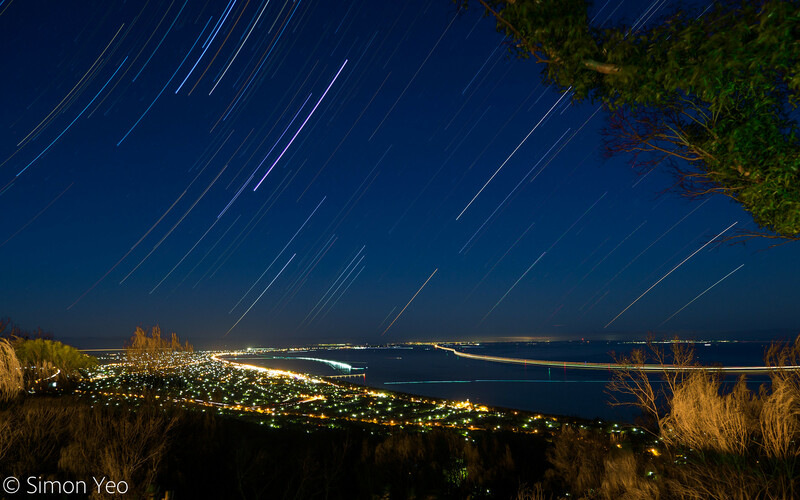 Especially the light trails from the vessels heading to Melbourne along the main shipping channel. My wife calls it a photo drive. Basically I chuck the camera in the car and head off somewhere to take photos. I might be gone for a couple of hours, or all day. I went for a photo drive a couple of weeks ago and headed west. My first stop was Stawell, the last was Wycheproof, with lots small towns in-between. All up I was gone for 23 hours – yes, it was a long day! My only regret was that I did this on the Friday before going back to work after the Christmas break, and I haven’t had much time since then to process most of the pictures taken on the day. The exception was the night time long exposure shots from Wycheproof. Live Composition is a mode in Olympus OM-D cameras that allows you to stack multiple long exposures in camera to create stunning star and light trail photos. I was excited to process the Live Composition shots from Wycheproof, where the railway runs along the middle of the main street. I featured a couple of those Live Composition shots on my Vic Pics blog, and they also got a good reaction on Flickr. I thought I would share a quick video from my phone taken during one of the hour long Live Composition shots, which shows the multiple exposures stacking and composing the end shot on the camera’s rear screen. I really like these long exposure composition shots, which bring out amazing star trails. I’ve got a few ideas for possible locations, so when the skies are clear, I’ll be off on another photo drive for some Live Composition photography.